This motorized touch-screen headunit is the ultimate in-car media accessory. First, it's got everything you expect in a modern headunit: AM/FM tuning, 30 station presets, auto-store and scan modes, an LCD digital display. Second, it's equipped with handsfree Bluetooth technology, so you can pair your phone with this unit and hear your calls in beautiful audio playing over your car's stereo system. Take calls and make calls using the on-screen phone controls. Easily play a CD, SD card, or USB drive with your favorite MP3s. The motorized screen telescopes out and up, easily folding away when you turn your car off. Plus, it's beautiful, boasting a 1440x234 pixel resolution, 400 nits brightness, and it's compatible with both PAL and NTSC inputs. 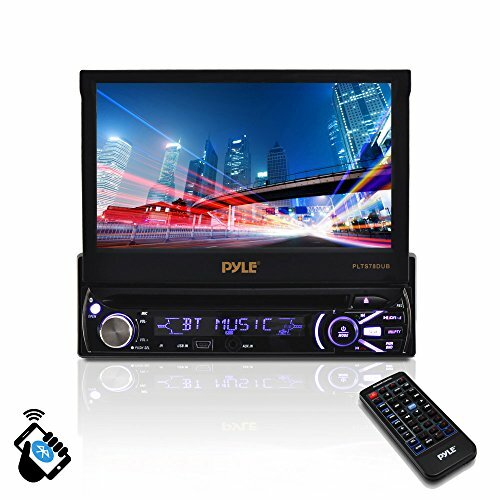 Enjoy a DVD movie on the 7' screen and get relevant info using the on screen display and the wireless remote control. You can also adjust the sound to your liking using the preset EQ settings - or manually adjust treble, bass, balance, fader, and encoder volume controls. Electronic shock protection ensures skip-free playback as your vehicle hits the open road. This unit is equipped with A/V inputs, so you can easily attach another video device like a backup camera. Provides 80 watts output over 4 channels for a maximum output power of 320 watts.